Kickboxing is a great hobby to pick up. It’s great for your body, it’s good for self-defense and it’s even better for your fitness. However, it’s not easy to find time to go to the gym and actually train there, which is why having a home gym is becoming a more attractive alternative for people today. Even those who still train in gyms think of having their own set of equipment at home just to squeeze a few extra workouts every now and then. If you plan on setting up your very own home gym, you’ll definitely need kickboxing equipment too. Of course, you’ll need gloves to train in kickboxing. 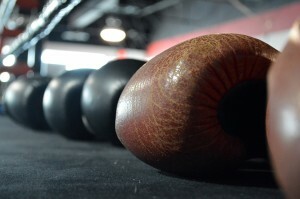 It doesn’t even matter if you’re training alone, because you’ll want something to cushion your hands while you punch away at the different bags. 14oz and 16oz gloves are ideal for pad or drill work, as well as sparring. You’re going to want to have mirrors installed in your home gym so you can see yourself while you’re working out. No, this isn’t to indulge your narcissistic tendencies, but rather, so that you can see and work on your technique constantly. Or, to put it simply, it helps you become much more self-aware and become your own teacher, which is necessary if you want to be successful with your kickboxing sessions in your home gym. Of course, when you’re working out, you’ll want everything to be safe and in case you fall, you want it to hurt a lot less. Mats make sure of that. The mats come in pretty cheap, especially if you go with the larger ones, since you don’t have to buy many. Buy a couple and cover the area you work out the most in, or if possible all of your home gym, and you should be good to go. You’re going to need speed bags and heavy bags if you want to get a lot of out of your home gym. After all, you’re probably not going to be sparring with someone for quite some time, so you may as well make friends with the heavy and speed bag. Also, keep pads in handy, in case someone comes in and wants to help you work on your strikes. Not that you’re going to need them every time you work out, but having a rack of a few dumbbells is going to do wonders for your physique, especially when you want to vary your workout between pure kickboxing and lifting weights. Last, but definitely not the least, you’re going to want to have a huge space to work out in. That is an absolute essential. It doesn’t have to be really huge, since you’re going to be alone, but it does have to be wide enough for you to kick, punch, and pretty much, do what you like while you’re in there. © 2012 CBF Kick. Theme by MyThemeShop.